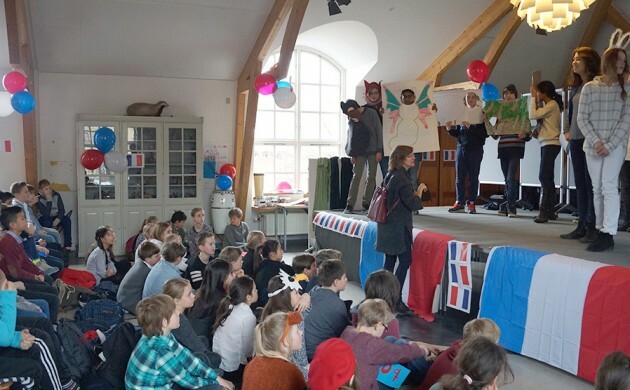 Henriette Hørlücks Skole in Odense hosted a French-language theatre festival for international schools in Denmark last week on Thursday. The festival was held for the fifth year running and was organised in co-operation with the French Institute in Denmark. Some 160 students aged 10-16 from Henriette Hørlücks Skole (including the international section), Rygaards School (both the Danish and international sections) and Engdale Skole from Aarhus participated. Altogether, the students performed 10 different short plays and sketches in French, and at the end some were awarded prizes for their acting efforts. “The Fête du Théâtre was once again a success this year. All the young actors left with a sense of school pride and personal achievement,” Chris Allo, the French and English teacher at Henriette Hørlücks Skole, told the Copenhagen Post Weekly.